Hold onto your chimichangas, folks. From the studio that brought you all 3 Taken films comes DEADPOOL, the block-busting, fourth-wall-breaking masterpiece about Marvel Comics’ sexiest anti-hero: me! Go deep inside (I love that) my origin story...typical stuff...rogue experiment, accelerated healing powers, horrible disfigurement, red spandex, imminent revenge. 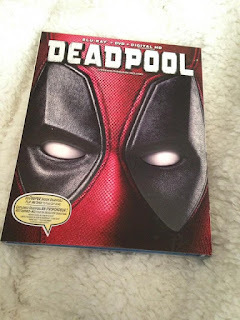 Directed by overpaid tool Tim Miller, and starring God’s perfect idiot Ryan Reynolds, Ed Skrein, Morena Baccarin, T.J. Miller and Gina Carano,DEADPOOL is a giddy slice of awesomeness packed with more twists than my enemies’ intestines and more action than prom night. Amazeballs! DEADPOOL will be available on Digital HD April 26 and Blu-ray and DVD May 10 from Twentieth Century Fox Home Entertainment. When I had heard about this movie I was all worried that it wouldn't be good but I tried to keep my expectation low. I am so happy to say that I found Deadpool movie to be very well done and I am so happy with Ryan Reynolds' performance. I loved every minute of this movie and I loved the Canadian jokes/references. Deadpool is very funny and very entertaining. It is very well written and I LOVE everything about this movie. I give Deadpool 5 out of 5.